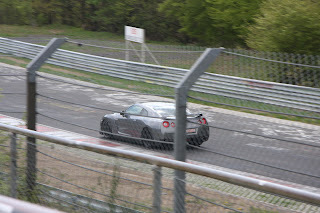 Nissan GT-R Does it Again : 7:26.7 At Nurburgring . 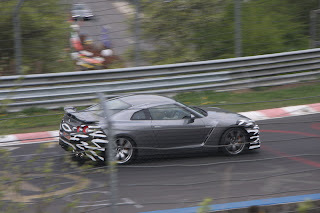 Nissan is at Nurburgring with a number of Nissan GT-R's doing testing. At least one car is wearing some camo. Maybe its a minor upgrade, or a variation on the bumpers they are offering. Perhaps they are just messing with us. The cars also seem to be running a variety of wheel and tire packages. Like the other times, we should find out soon. 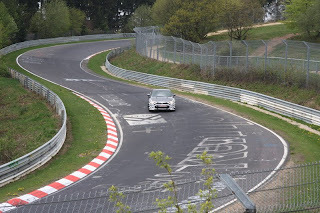 Hmmmmm No mention of the Spec V running laps? 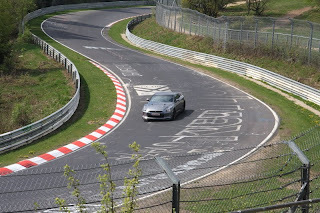 Gotta wonder what the camo car is, maybe a Spec M?